It arises at the upper pole of the thyroid lobe, travels upwards as well as laterally, and drains inside the internal jugular vein. The superior thyroid vein and the branches of the superior thyroid artery correspond to each other. It is created by deep and superficial tributaries and is merged via the superior laryngeal as well as cricothyroid veins. 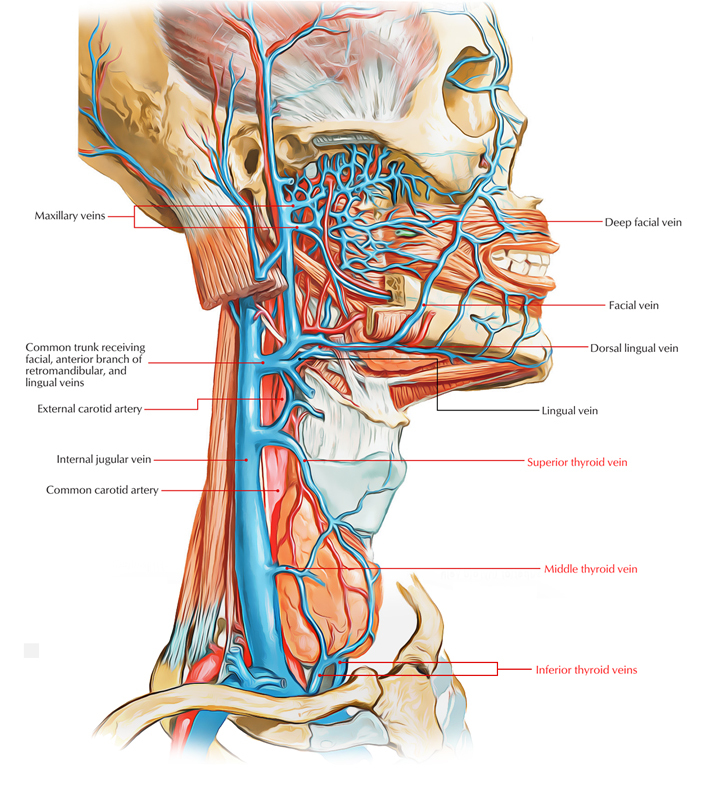 It is a contributor of the internal jugular vein or facial vein. The inferior part of the thyroid gland is drained by the middle thyroid vein and also obtains some veins via the larynx as well as trachea. It also contributes to the distal portion of the internal jugular vein and bypasses anterior towards the common carotid artery. In order to soon insert in the internal jugular vein, it arises at the middle of the lobe. The inferior thyroid veins arises from the lower margin of isthmus as well as in order to open in the left brachiocephalic vein travels downwards at the anterior surface of trachea; however they occasionally open inside corresponding brachiocephalic veins. In front of the trachea, the right and left inferior thyroid veins often interconnect with each other. Bleeding during tracheostomy is due to injury to these veins. These veins obtain esophageal, tracheal and inferior laryngeal veins, and have valves at their ends within the brachiocephalic veins. They create plexus in front of the trachea and afterwards in order to drain into the left brachiocephalic vein travel downwards. A left vein descends and joins the left brachiocephalic vein. A right vein travels obliquely downward and in order to open into the right brachiocephalic vein towards the right across the brachiocephalic artery just at its junction with the superior vena cava. Occasionally the right and left veins open via a common trunk. Sometimes as a variation, a fourth vein referred to as the thyroid vein of Kocher arises in the middle of the middle and inferior thyroid veins in order to drain inside the internal jugular vein.